Home » Eastern U.S. Buildings » Washington D.C. The United States Capitol is located at Capitol Hill in Washington D.C., construction and expansion has been taking place since 1793. This building was designed by William Thornton and stands 288 feet tall with 5 floors. This pewter replica stands just less than 2-1/4 inches tall and is finished in white. This model's scale is 1 inch = 150 feet. 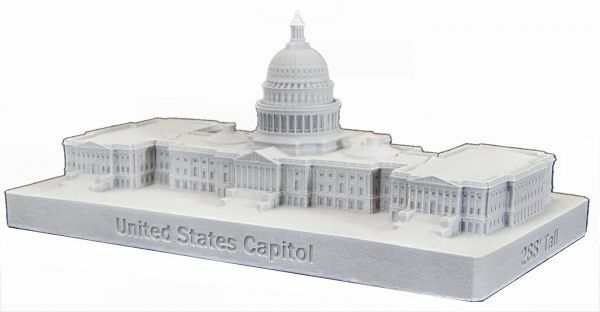 That's the best model from the United States Capitol ! I was one of many 'cheerleaders' to have this done and I am glad becauae now I have the best model of the capital. Sonetimes squeeky wheels do get greased!